You will need some experience of Kotlin, and familiarity with Android Studio. You will also need Node and Create React App installed. Many business need to be very responsive to customer requests in order to be competitive. This works both ways - the business being informed immediately when a new order comes in, and the customer being informed as to the progress of their order. 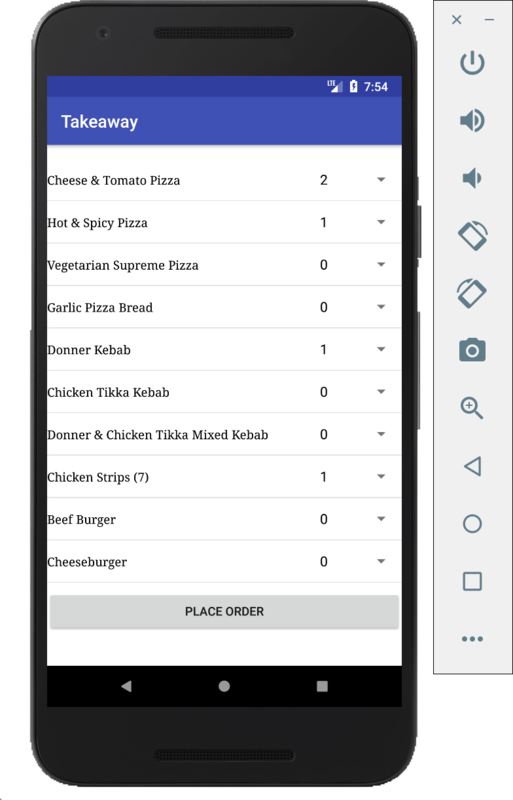 In this article we are going to build a simple takeaway application, featuring a web app for the takeaway itself to use, and an Android app for customers. The web app will be updated automatically using Pusher Channels, and the Android app will receive notifications using Pusher Beams so that the customer and staff are always aware of everything going on. In order to follow along, you will need some experience with the Kotlin programming language, which we are going to use for both the backend and frontend of our application, as well as with Android development. We are going to be building the web UI that the takeaway uses with Create React App, so ensure that this is installed, along with a recent version of Node.js. You will also need appropriate IDEs. We suggest IntelliJ IDEA and Android Studio. Finally, you will need a free Pusher Account. Sign up now if you haven’t already done so. Our overall application will have a backend application, a web UI that is to be used by the takeaway company, and an Android application that is targeted to the customers. Customers will order food using the Android application, and the orders will appear in the web UI in real time using Pusher Channels. The takeaway company can then use the web UI to update progress on the orders, which will be sent directly to the customer’s device using Pusher Beams, keeping them updated on the progress of their order. The backend application then acts as orchestration between the two UIs. We are going to use two different Pusher accounts for this application - a Pusher Channels account for real time updates of the web UI, and a Pusher Beams account for notifying the customers of the status of their orders. In order to follow along, you will need to create a free Pusher account. This is done by visiting the Pusher dashboard and logging in, creating a new account if needed. 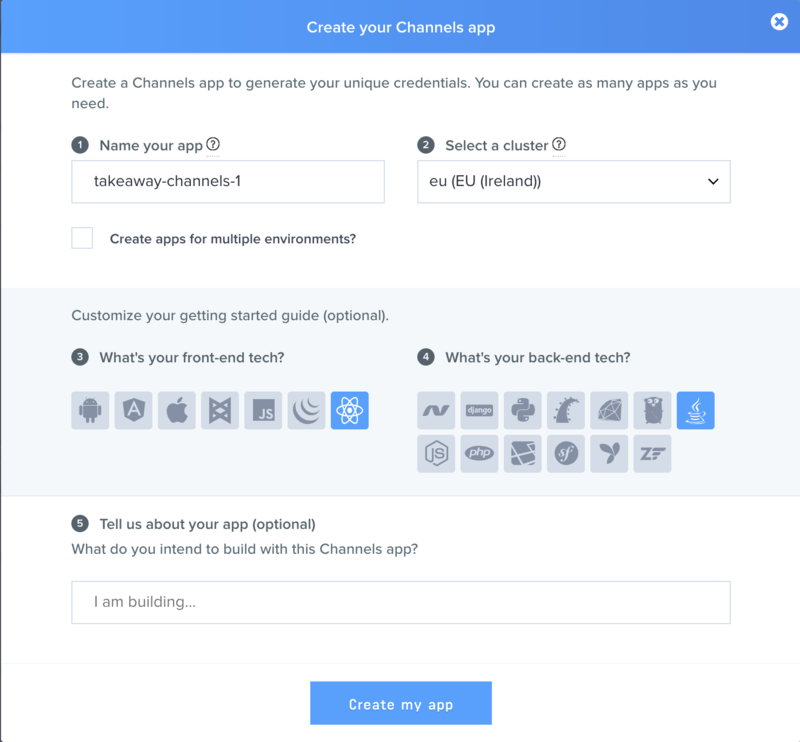 Next click on Channels apps on the sidebar, followed by Create Channels app. Fill out this dialog as needed and then click the Create my app button. Then click on App Keys and note down the credentials for later. In order to use the Beams API and SDKs from Pusher, you also need to create a new Beams instance in the Pusher Beta Dashboard. Once you have created your Beams instance, you will also need to note down your Instance Id and Secret Key from the Pusher Dashboard, found under the CREDENTIALS section of your Instance settings. 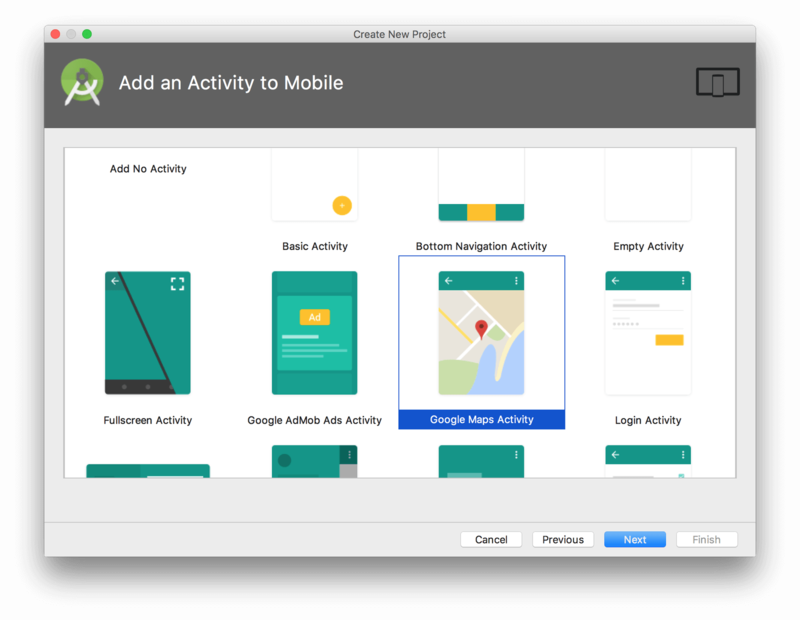 We are going to build our backend application using Spring Boot and the Kotlin programming language, since this gives us a very simple way to get going whilst still working in the same language as the Android app. The first of these is the Pusher library needed for triggering push notifications. The second is the Jackson module needed for serializing and deserializing Kotlin classes into JSON. An orders resource will contain a number of menu-items entries, with the status of them. The customer application will create a new order containing a simple list of these entries, and then the staff application will update the status of each item as is completed. Once they are all completed it will then update the order status to indicate that the food is out for delivery, and that it has been delivered. The creation of an order will cause a Pusher Channels message to be sent out, containing the new order. Every time an order is updated will cause a Pusher Beams message to be sent out, containing the status of that order. The first thing we’ll do is to support listing of menu items. Note: the @Component annotation means that Spring will automatically find this class and make it available for other classes to use. Note: the @CrossOrigin annotation makes this controller accessible from web applications running on a different host and/or port. The next part is to manage the orders themselves. For this we want to be able to create, update and list the orders that are being processed. You’ll note that there are actually 4 classes here. These represent, between them, the entire order. A single order contains a status and a list of order items, where a single order item contains a menu item and the status of that order item. This allows us to update each order item independently of any others, including if one order contains multiples of the same menu item. Next, create a new class called OrderDao. This is going to represent our data storage for orders and order items. This has some business logic around when the status of an order or an order item is updated, in order to correctly transition the order through it’s lifecycle. Note: there is no error handling here. Actions such as providing an invalid ID or status will cause a bad error to be returned. In a real application this would need to be handled properly, but for this article we don’t need to worry about it. Once we have our backend server able to manage our orders and order items, we need to keep all of our clients updated. This includes both the web UI for the restaurant and the Android UI for the customers. For this, we are going to be sending events using both Pusher Beams and Pusher Channels. 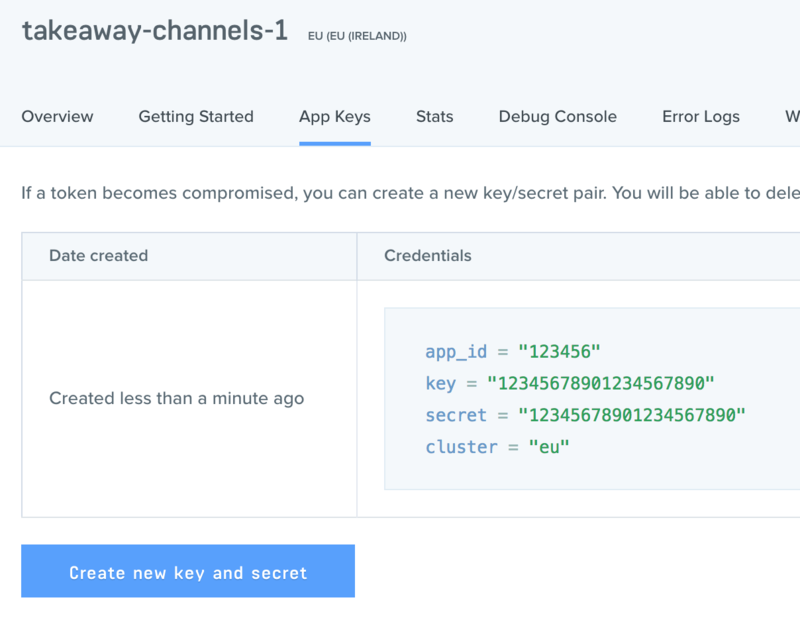 Note: remember to replace CHANNELS_APP_ID, CHANNELS_KEY, CHANNELS_SECRET, CHANNELS_CLUSTER, BEAMS_INSTANCE_ID and BEAMS_SECRET with the appropriate values obtained when you registered your Pusher application details. At this point, our backend does everything necessary to support this application. This also installs the modules for communicating with our backend - axios for making HTTP calls and pusher-js for receiving the Pusher Channels messages - as well as Semantic UI for our styling. Note: at the time of writing, this also installs babel/runtime version 7.0.0-beta.48, which has a serious bug in it. If this is still the case then you can fix this by running npm install --``save @babel/runtime@7.0.0-beta.47. Note: this makes calls to http://localhost:8080. In reality you will need to replace this with the real URL to your backend service. This will render a table containing all of the order items, each of which has a button next to it to update the status of that item. There will also be a button, if applicable, below the table to update the delivery status of the entire order. Note: ensure you replace and with the same values as used in the backend application. This contains a method that will make two API calls - one each to our /menu-items and /orders endpoints - and combine the results together. Then it will update the component state with this result, which will cause it to render our Orders component with the resultant list. We also register to listen to the Pusher events that we broadcast earlier so that every time we get an indication that the orders have changed we can go and refresh our list. This renders our ConnectedOrdersList component that we’ve just defined as the main body of our application. 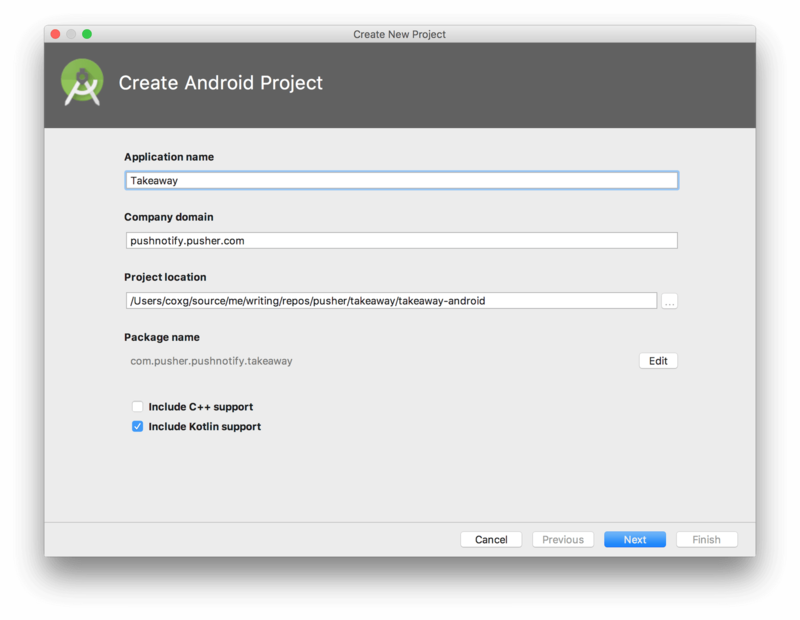 The customers Android application will also be built in Kotlin, using Android Studio. 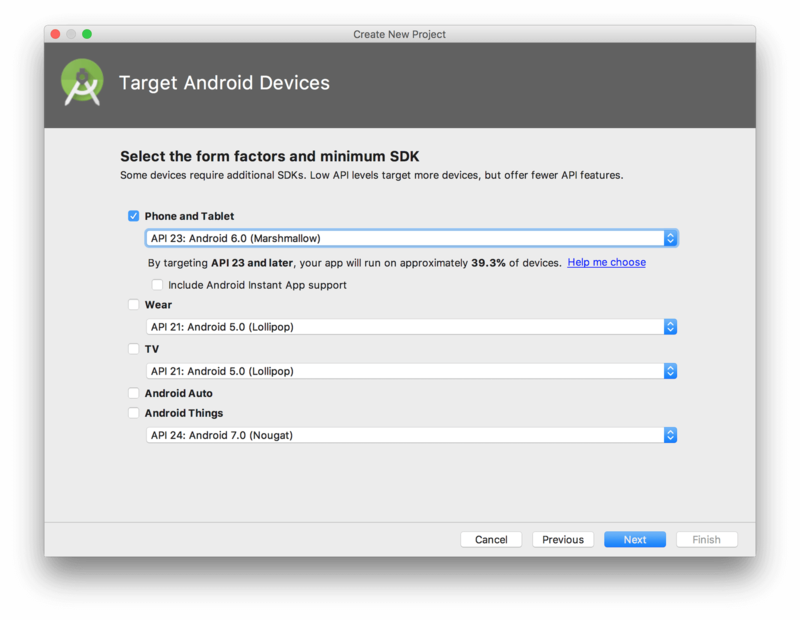 To start, open up Android Studio and create a new project, entering some appropriate details and ensuring that you select the Include Kotlin support option. 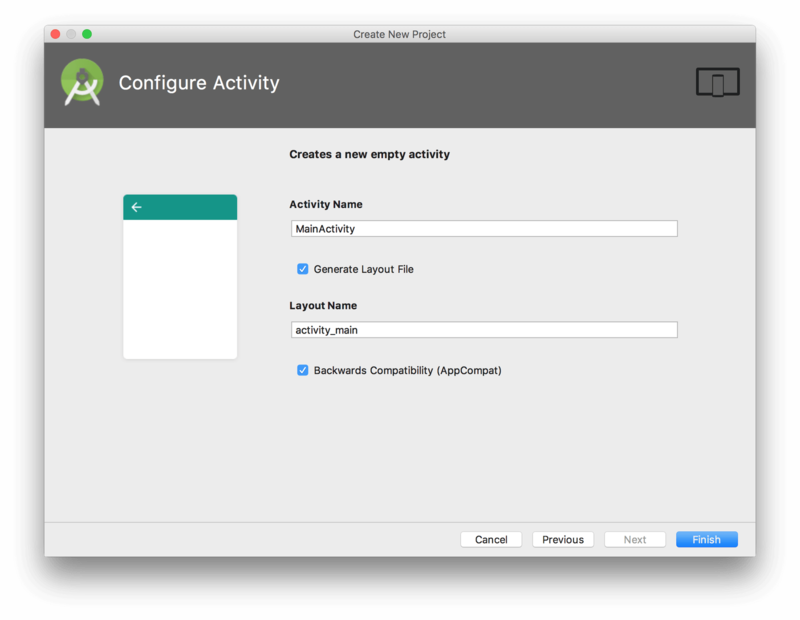 Note that the Package name must match that specified when you set up the FCM Server Key earlier. The main screen that we are going to show is a list of menu items, allowing the user to place an order. This gives us a list to show our menu items, and a button with which to place the order. You’ll notice that this is identical to the MenuItem class on the backend. This is unsurprising since it represents the exact same data. This has two entries in it - an item name and a spinner. The spinner control is effectively a dropdown, and will be used to select how many of each item to order. Amongst other things, this includes a hard-coded list of values for the spinner control - allowing the user to order up to 10 of any single item. Note: 10.0.2.2 is the IP Address that the host machine appears when running inside the Android emulator. In reality you will want to use the real host of your service. Now that we can see the list of items that can be ordered, we need to be able to place an order. Firstly, we need to be able to get the list of items that have been selected to be ordered. This will be coming out of the MenuItemAdapter class, as this acts as the interface to the list of items. The first of these is a private map that will act as a mapping between each item and the number of that item to order. The second is a computed property that returns a list of the items to order, with one entry for each item. This means that if we order three pizzas, there will be three entries in this list. This is triggered every time a new value is selected for any item, and will cause our map to be updated to match. Note: the “this@MainActivity” syntax means to get the “this” value that refers to the “MainActivity” class, as opposed to the “JsonHttpResponseHandler” inner class that we’re actually executing inside. This now does everything necessary to place an order on the server, including displaying an error message if the user did not select any items to order when pressing the button. Now that we can place orders, we want to be notified as to the progress of the order. This will include a progress bar for the part of the process where the order is being prepared, and then simple strings to indicate that the order is out for delivery. Note: remember to replace BEAMS_INSTANCE_ID with the appropriate value obtained when you registered your Pusher Beams application details. Note: if it is ambiguous, the NotificationCompat import should be for android.support.v4.app.NotificationCompat. This gives everything for the customer to keep updated with their order. Ensure that the backend and web UI are running, and then we can test it all out together. This article has hopefully shown how easy it can be to integrate Pusher technologies into your application to give real time updates to both the customer and staff user interfaces. Even though we use two totally different Pusher technologies - Pusher Channels and Pusher Beams - they work seamlessly together to give a full featured experience. The full source code for this article is available on GitHub. Why not try extending it support more functionality - for example, multiple restaurants.